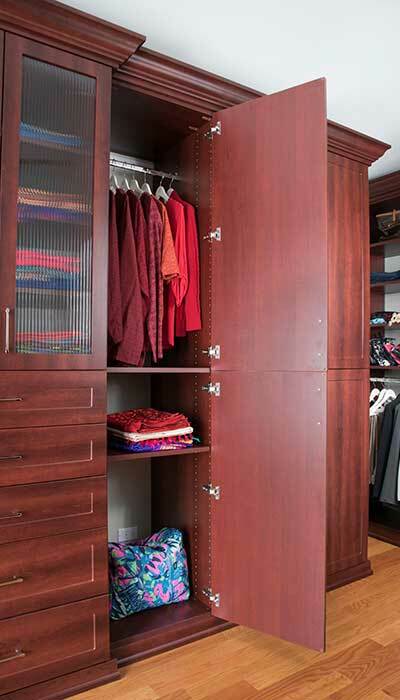 Custom Armoire/Wardrobe Closet System — Closed. 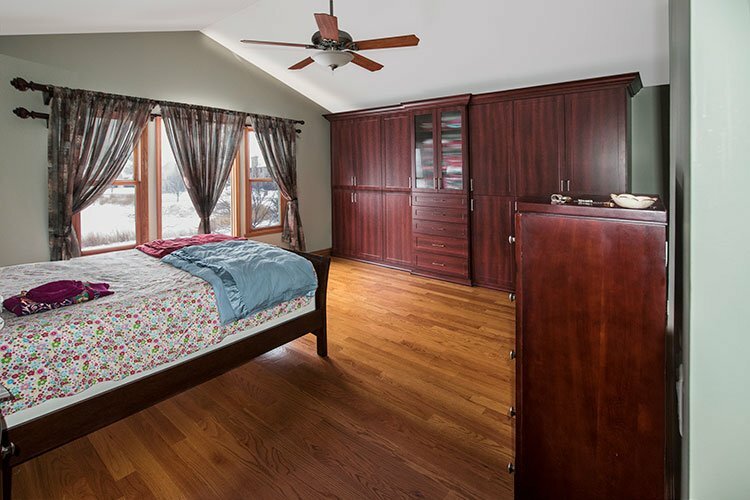 The cherry laminate was selected to pick up the natural color and undertones of the client's existing bedroom furniture. Wardrobe Closet — Open. Plenty of storage space is available for both hanging and folded clothing. Drawers were included for small articles of clothing. The two piece closet wardrobes system is built against one wall of the bedroom and fits nicely under the vaulted ceiling. At the far left corner of the room, there are a series of outlets and cable jacks. The system begins ten inches from the left corner of the room to retain access to these electrical and media hook-ups while keeping the cables hidden from casual view. 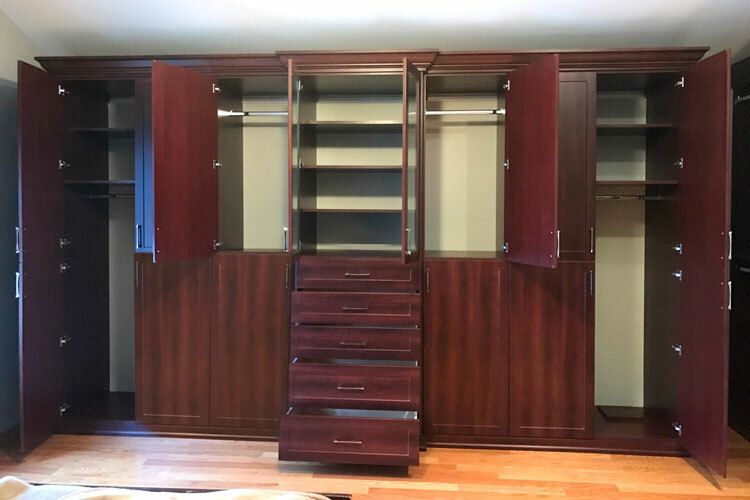 Note how well Closet Works was able to match the color of the armoire/wardrobe to the client's existing furniture, creating a cohesive solution for the master bedroom. 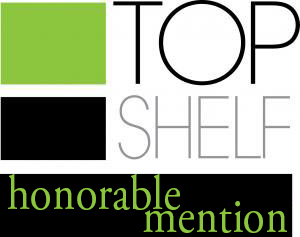 This custom wardrobe closet for a bedroom with a cathedral ceiling won Honorable Mention/2nd Place in the national Top Shelf Design Contest. This wardrobe was created for a couple that has a very large master bedroom with a cathedral ceiling and a relatively small master walk-in closet off the master bath. Since the clients prefer not to watch television in the bedroom, we decided to take advantage of an open wall that is nearly 17 foot wide with an alcove at the far right side of the wall. 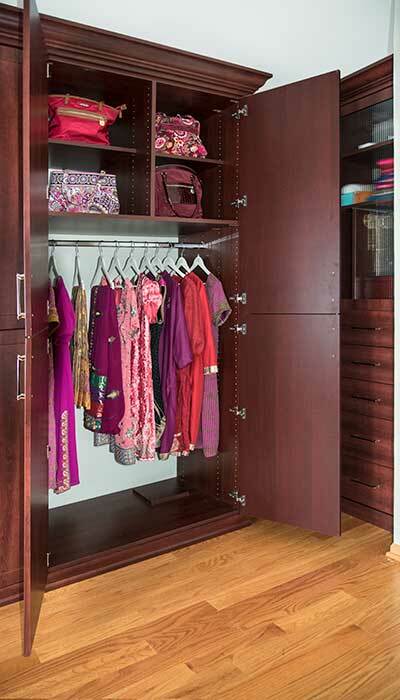 The clients wanted to create a system to store a combination of short hanging, long hanging, folded items, purses, drawers, folded garments, jewelry storage, hooks for necklaces and bracelets, a place to store their laundry hamper, and shelving with doors to display a beautiful collection of saris. 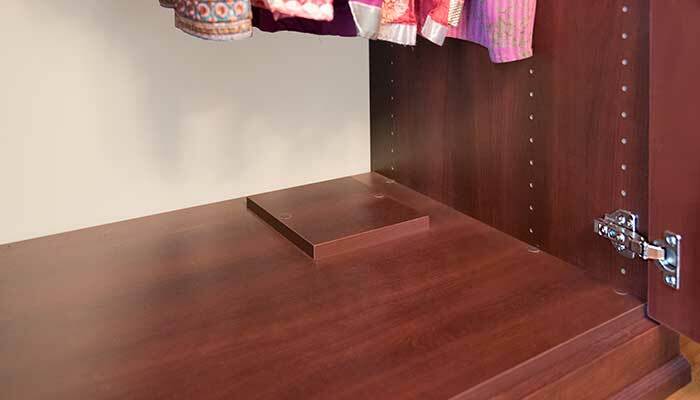 Although the systems were designed with the wife's needs in mind, the husband wanted to maintain a small area where he could iron clothing within the bedroom and hang a few garments for special occasions. After much discussion, we decided to create a small section for the husband in the alcove portion of the bedroom along with a section of drawers with shelving and pullout necklace/bracelet storage for the wife. The large bedroom feaures a vaulted ceiling, and the new closet needed to accommodate the unique slanted ceiling. 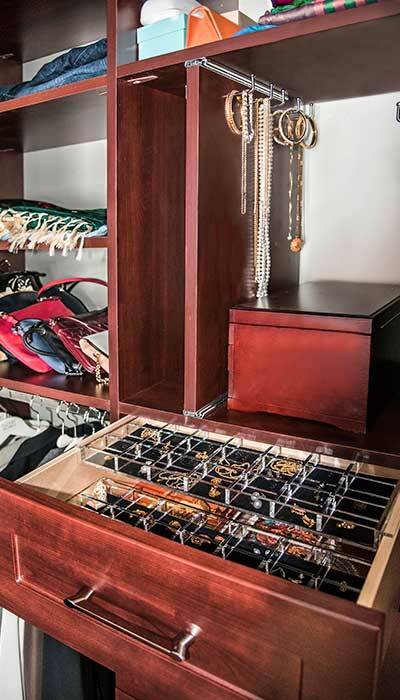 Closet Works designers are masters at designing premium storage systems that not only work within the confines of the angles, but take advantage of every square inch of space. 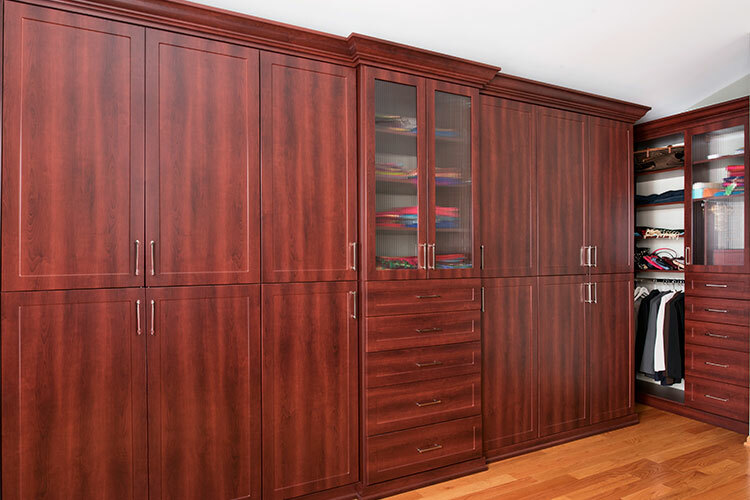 This grand and luxurious bedroom wardrobe closet appears to stop slightly short of the full height of the room, however, the back of the piece touches the ceiling due to the angle. 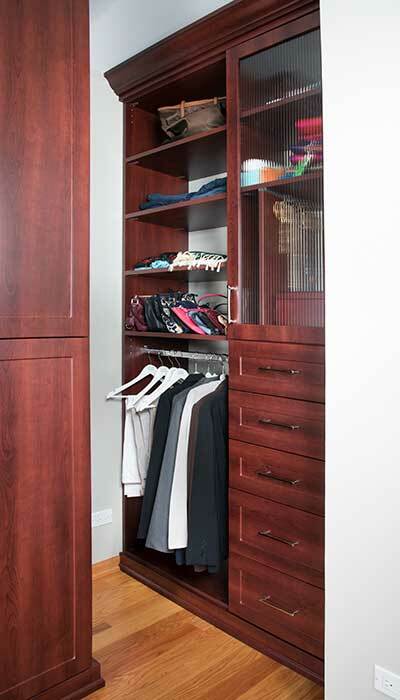 The closet system fits snuggly against the wall while taking advantage of every possible inch of ceiling height. Having the front of the unit stop slightly shy of the ceiling presents a classic armoire furniture look as well as creating enough height for double hanging clothing — a requirement in order to create enough storage to handle the owner's extensive and colorful clothing collection. 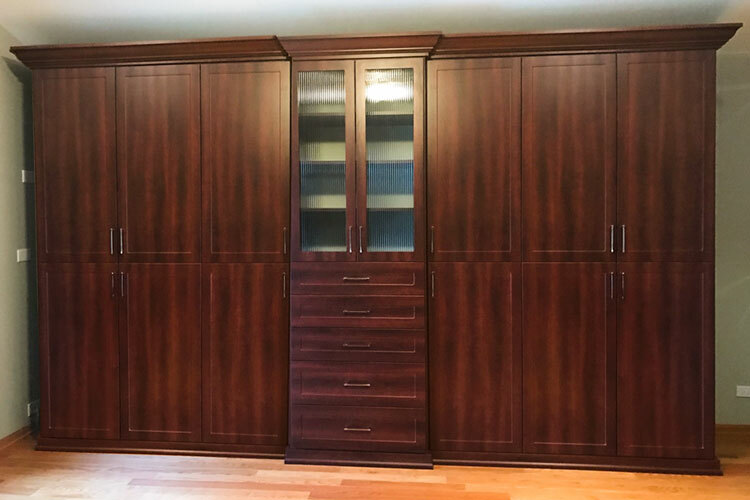 This bedroom closet has been given a timeless and classic appearance through the choice of Shiraz Cherry laminate along with Mission Shaker closet door and drawer fronts that blend seamlessly with the furniture that the owners already had in the bedroom. The center section is 2-1/2 inche deeper than the adjacent sections to allow the crown and base mouldings to be mitered together around this protruding section. An undesirable random split in the mouldings would have occurred without the deeper section. 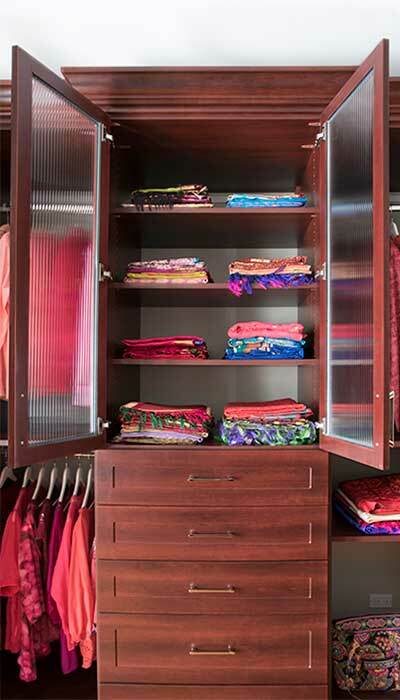 This deep section includes enclosed shelving with a bank of drawers, further enhancing the closet/furniture look. For an opulent effect that screens clutter while simultaneously making the contents visible, reeded glass inserts are used on the central cabinet doors. Although the main wardrobe is quite large, a corner alcove under the eaves is equipped with a second wardrobe unit, further increasing the usable storage space and permanently solving the "no closet in bedroom" dilemma. Special considerations included the ability to hide all the outlets and cable jacks, while keeping them accessible. 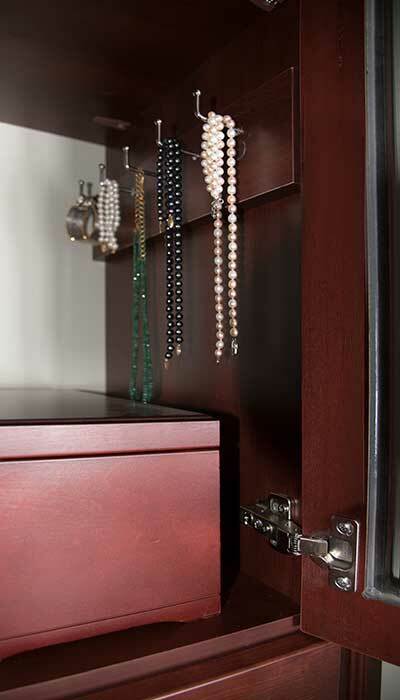 Jewelry organizers with acrylic jewelry drawer for wall closet system. 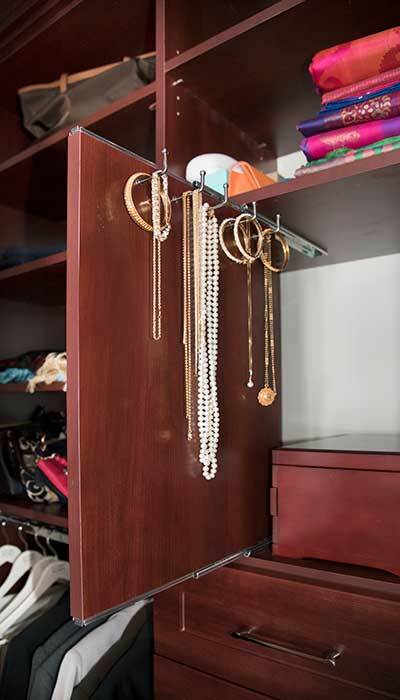 Vertical pull out jewelry organizer for necklaces and bracelets. Smaller alcove closet section of the 2-piece custom wardrobe/armoire. 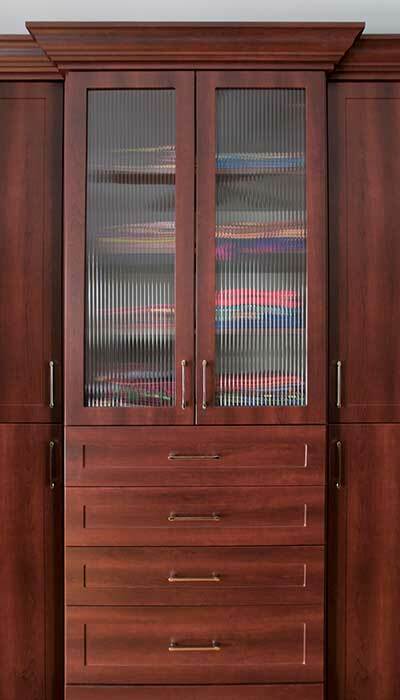 Center section of 2-piece custom wardrobe/armoire with glass doors open. The center section is 2-1/2 inches deeper to allow the mouldings to be mitered. Two piece doweled doors function as a single large door, concealing shelves and hanging areas. 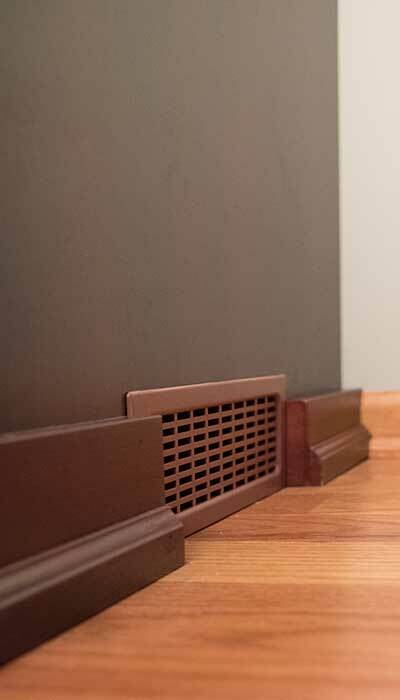 Closet system includes a vent on the side for the HVAC system. The right section contains shelving, medium hanging and an access panel for the HVAC servicing in the floor panel. Close up of HVAC access panel for cleaning the heating vents. 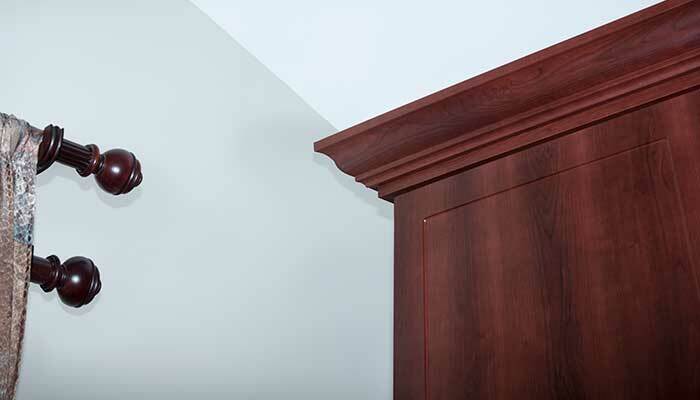 The crown moulding is designed to work with the slope of the vaulted ceilings.